Whether you show, breed, course, adopt, or simply keep an Afghan Hound as a pet, Nutmeg is the club for you! For more information, please contact any of the members below or if you would like to join, please use this membership application. For questions regarding this application, please contact the Corresponding Secretary, Lucia Brown. Do I need to own an Afghan Hound to join? Absolutely not! Come and talk with some of our long-time and esteemed members, among whom are noted Afghan Hound judges. Let us help you with your choice of a life long friend. I don't show. Why should I join? 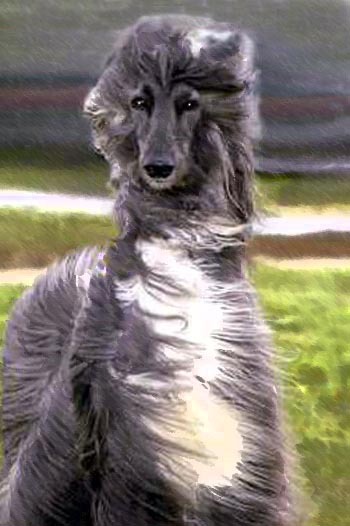 There are so many other things to do with your Afghan Hound besides Conformation Shows. Lure Coursing, Obedience, Agility, Rally, to name a few. Come and join the club camaraderie. You can also help support Afghan Hound Rescue by being a foster home, help in transporting a rescue or by doing a home visit of a potential home. What else can Nutmeg membership offer me? Our members' combined years of knowledge can provide you with the support and mentorship essential to a successful experience with Afghan Hounds. New members who love and support this very special breed are an essential element to the continued success of the Nutmeg Afghan Hound Club. We invite you to help us shape the future of the club and the breed you love! Each year Nutmeg puts on an Afghan Specialty Show which requires many people with different talents. Our Show is well known throughout the US and many other countries and attracts Afghan Lovers from everywhere. We are very proud of our Show and being part of it is very satisfying !